(APN) ATLANTA — In our continuing coverage of the City of Atlanta 2017 Municipal Elections, this article presents the questionnaire responses of Amir Farokhi, who is running for Atlanta City Council District 2. The District 2 seat, which includes much of Downtown and Midtown, as well as Old Fourth Ward, is currently held by Kwanza Hall, who is running for Mayor of Atlanta. Farokhi ran in 2009 for the Post 2-at-large seat (not the District 2 seat), and went into a Run-off with now-former Councilman Aaron Watson, who held the Post 2-at-large seat from 2010 to 2013. 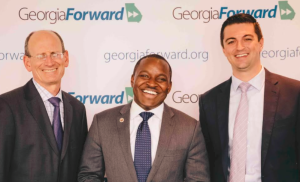 Following his election loss in 2009, Farokhi went on to serve as Executive Director of Georgia Forward, an organization he co-founded that was “incubated” by Central Atlanta Progress. Central Atlanta Progress is a downtown business organization whose policy agenda for Downtown Atlanta has involved a conspiracy to sabotage the Metro Atlanta Task Force for the Homeless; the criminalization of panhandling; and the harassment of homeless people. In 2013, Farokhi stepped down as Georgia Forward CEO, and Howard Franklin–who has served as Farokhi’s campaign manager in 2009 and currently in 2017–became CEO of the organization. Farokhi currently works for Boston Consulting Group, a global management consulting firm which, among other things, has been described as the “Bain Capital of public education.” BCG has been a leading proponent of privatization and charter schools. Farokhi also has close ties to A.J. Robinson of Central Atlanta Progress (CAP). Robinson serves as Board President of Georgia Forward, and appears to have a close working relationship with both Farokhi and Franklin. In an interview, Farokhi said he is not the Central Atlanta Progress candidate in the District 2 race. “My nonprofit was incubated by CAP. They gave us office space. I was never an employee of CAP. I take particular issue with taking a more heavy-handed approach on the panhandling question,” Farokhi told Atlanta Progressive News. “I think we need to be more… [supportive of] human dignity. We don’t have the best history of that in Atlanta. I don’t necessarily agree with CAP’s approach. Sometimes they are right, and sometimes they’re not right,” Farokhi said. Aside from his run for Council in 2009, Farokhi has had little or no involvement in City of Atlanta issues. Five candidates have qualified, including Farokhi, Stephon Ferguson, Zelda Jackson, Nick Mulkey, and Lauren Welsh. APN emailed a questionnaire to Welsh on August 03, and she confirmed receipt on August 05. APN will be sending out more questionnaires shortly. Requiring that surplus city parcels that are suitable for use as housing be sold to nonprofit developers for $1 to develop affordable housing. Promoting the production and preservation of units at 0 to 30 percent AMI of the Area Median Income (AMI) across all City of Atlanta policies. This is the income bracket with the greatest and fastest growing unmet need, whereas the recent trend in City housing policies has been to produce affordable units at higher levels of AMI. I agree that those making 0-30% tend to be overlooked in the affordable housing conversation today. Whether it’s through inclusionary zoning, community land trusts, repurposing existing properties through AHA or Invest Atlanta incentives, or protecting existing low-income housing, we must be mindful to protect and grow housing options for those who are most vulnerable in the housing conversation. I fully support this legislation though would have liked for it to provide for housing for those making between 45-60% AMI (it currently calls for 60-80% AMI). I support this in theory but would like to learn more about APN’s view of how this might look legislatively. I fully support an inventory that also leads to a plan of action for promoting and fostering economic diversity in housing across the City. I support lobbying the City of Atlanta delegation to create more property tax tools to incentivize development of high-quality affordable housing. What those reforms should be remains to be seen though those listed in this question are all worthy of exploring. To be effective in lobbying the state on these issues, the City will need to find active allies across the state and in the nonprofit development sector. I support this idea. However, we need to prioritize the tools available to the City to create and incentivize affordable housing. Protecting existing affordable housing can minimize displacement and reduce development costs. I would also like to see any legislation in this vein have building standards that ensure updated units energy efficient and renovated to a standard that does not ignore the quality of life of those who will reside in the unit. Yes, I support increased use of community land trusts. This is tougher in District 2 given the high cost of land right now but we have great opportunity across the City to use community land trusts to build affordable housing and equity. Yes, I support accessory dwellings, and zoning to support them, though they cannot alone be relied upon to solve our affordable housing challenges. They are one tool to be used to create affordable housing. Yes, insofar as it focuses on building and renovating housing for those making 0-50% AMI. I would also like to explore requiring developers who build market rate housing to contribute to an Affordable Housing Trust Fund, relative to the cost of their development, and that such funds be used to support additional affordable units near the market-rate development. Yes, absolutely. This is a key component of my affordable housing platform. If we are going to talk about solutions for Atlanta, let’s use the actual AMI for the City itself, which is lower than for the region. I love the idea of this and am in favor of exploring a program similar to Seattle’s. The role of money in politics can overwhelm and diminish the voices of those without wealth or power. Restoring equity and empowering all residents to participate to the election process is something at which we need to examine closely. In part, yes. I support the exploration of banning contractor political contributions one year before bidding and limiting successful bidders to $250 candidate contributions after that period with aggregate total limit contributions from a corporation holding a city contract of $2,600 annually. I do not support banning campaign contributions from individuals employed by entities doing business with the City of Atlanta. Until we have public financing system for municipal elections, we need to be fair to individuals who wish to exercise their personal right to contribute to candidates. I support exploring banning contracted entities from contributing to candidates. I am in favor of ensuring that the public is heard at City Hall. For committee meetings, the City Council needs to balance the need for robust public comment with the efficiency of conducting meetings. While in theory, no time limit to public comment sounds equitable and fair, it runs the risk of grinding meetings to a filibuster-style delay. I am open to lengthening the time for public comment where there is heightened public interest on an issue and, more efficiently, finding new ways for the public to contribute to committee input, including real time online comments and collection of comments before a hearing from those that cannot attend but want to speak up. Seattle has actually been ambitious in widening the net for public input beyond traditional neighborhood groups and homeowners. Recognizing that many residents are not property owners with jobs that allow them to attend an evening meeting, Seattle has worked to reach out to renters, young people, immigrants, and others who have often not been traditionally solicited for public input on policy decisions. Approaches have included telephone town halls, booths and tables at festivals and apartment complexes, etc. We should look to gather input from a wider array of residents as well. I am always open to a more dynamic and engaging meeting process if it is balanced the need to address council business in a timely manner. I welcome the opportunity to talk further with APN on what this could look like. Again, I’m not sure. Typically, working sessions should be used to do some of the “heavy lifting” before a committee meeting. Perhaps there is a way to solicit public input via online submission before and during the meeting. Do you believe Committee Briefings should be videotaped? Yes. Additionally, I hope Governor Deal’s Criminal Justice Reform commission will address this issue at the state level. No. While I believe a vibrant nightlife is part of any great city, until our public safety resources and staffing are sufficient to maintain public safety in high traffic nightlife areas, I’m not in favor of extending bar hours to 4 a.m. Yes. I have called for City operations to be powered with 100% renewable and/or clean energy by 2035. Solar should play a major role in that. Moreover, we should explore ways to increase private commercial and residential solar use. One approach is through a community solar project in which residents share access to solar power. Rather than burdening the power grid through net metering (the process of selling excess energy back to power utilities), provide city residents/businesses who don’t have the desire/means to invest in solar themselves with a communal plan through which they might share the energy produced by government building solar panels. In addition to solar panels, we should explore investing in microgrid technology which would allow the energy created/consumed by community solar panels to be stored/traded amongst members of the sharing project rather than selling it directly back to the power utility. A few ideas: Increase the number of small, public recycling centers, whether run by the city or a non-profit, for residents to drop off recyclables, particularly those who live in multi-family dwellings that may not have recycling service. Publicize recycling in a fun, meaningful way for residents and visitors. Houston has used artistically-designed recycling trucks to boost curbside recycling. Partner with cultural and entertainment institutions to offer discounts to those who participate fully in curbside recycling. Our sales tax is among the highest in the country. Yet, given that City residents, through property taxes, pay a disproportionate amount toward city services that serve tens of thousands of non-Atlantans every day, our sales tax components are well placed. The TSPLOST, MARTA, and MOST components of our 8.9% sales tax rate are critical to addressing our infrastructure backlog and future demands. If permitted by the state, I am also in favor of a 1/10 penny tax that would be dedicated for the arts. I am against a sales tax rate that climbs higher than 9% in the coming 5 years but am supportive of our current sales tax rate insofar as the City and its voters can control it. In order to reduce the heavier impact a high sales tax has on our low-income residents and move toward lowering the sales tax rate, we must, in part, find new revenue streams for the City for which non-residents bear a larger burden (e.g., a higher parking tax) alongside increasing efficiency in City operations to reduce operating costs. The Crosstown Midtown street car extension. Transit that connects people to jobs, especially east-west connectivity is a massive area of concern. This proposed streetcar extension runs across the middle of the city, from one side of the Beltline to the other: from Bankhead MARTA station across North Avenue to Ponce City Market. To be meaningful and connect to the existing streetcar, this would also require the Luckie Street extension. This Crosstown Midtown extension would fill a transit gap, connect existing residential centers on the west and east sides of the City with job centers in Downtown and Midtown, and tie into MARTA train stations. Built-in ridership/demand from the start and will do wonders to build momentum and ridership for the anemic streetcar. And, of course, alleviate traffic in rapidly growing sectors of town. Clifton Corridor MARTA’s proposed Light Rail Transit line to connect Emory/CDC to existing MARTA stations. One of our region’s largest job centers should be accessible via transit. This would spur innovative TOD and reduce congestion in the northeast area of our city. Pedestrian infrastructure: safe new sidewalks, new crosswalks, with an eye to complete streets that encourage walking. We neglect our sidewalks in an alarming way, especially as more and more residents walk, age in place, and raise families in the City. In my view, neglect of this magnitude on basic services reinforces the assumption that City Hall cares little about the ordinary taxpayer. We can do better. Sidewalks are a public asset and should be maintained and repaired by the City. As our density increases and residents have the ability and desire to walk more places, we must ensure that our sidewalks are safe, clean, and well-designed. A parent pushing a child in stroller, a citizen out for a walk, or a senior trying to get to the bus, shouldn’t have to worry about tripping and falling on broken sidewalk. Our city deserves sidewalk infrastructure befitting of livable, world-class city. Ask APD to enforce vehicle infractions against those crossing the street legally. I commit to using my Council Office budget on staff, policy development, and constituent outreach. Indeed, I see the benefit of limiting all Councilmembers to the same but I would need to learn the history of the rules and their intent before forming a full opinion on the matter. Ultimately, Councilmembers should be focused on the work of legislating, not currying favor with voters through pet projects. However, in some communities, where the City has failed to deliver services, I can understand why a Councilmember may use his/her council funds to fill a gap (e.g., sidewalk repair, etc.). Yes. If elected, I will have to leave my current place of employment (BrightHouse/Boston Consulting Group) due to company policy intended to avoid conflicts of interest for the company. If elected, I will find new full-time employment aside from serving on City Council. It is too early to know what that employment will be.